MOVEMENT is LIFE….MUSIC is a MELODY of the HEART ….And DANCE is the FREEDOM of MOVEMENT to MUSIC…. ALLOWING yourself to DANCE becomes a LIFE of allowing your HEART and SOUL to FREELY sing it’s SONG. Many HEARTS have sung their SONG through generations of human kind. At DANDODANCE we believe that by connecting to those SONGS we connect to OUR HEARTS and allow ourselves to HEAL, GROW and EXPAND as individuals. That is why DANDODANCE incorporates different genres and welcomes people of every age, size, shape and experience. Why do people come to dance? Most people come to dance for other reasons than dancing: to get healthier, enhance their social life, meet new people, make friends or maybe even find a life partner. To increase ones fitness level or lose weight. For business-oriented people, it is a new community and a new market to promote their services. Where some people come simply to have more fun in life. To put people in touch with the joy that is dance and to promote the wellness and harmony of individuals through it. 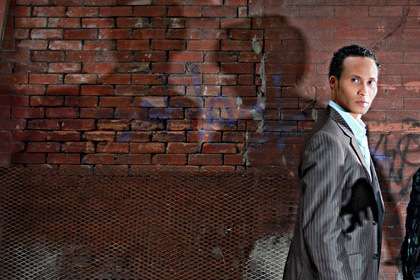 David is known as a pioneer of Salsa in Canada on the international competitive circuit. He has placed as high as 6th in the Mayan World Championships in 2002 and was one of the original organizers of Alberta Open Salsa Championship which has now grown into the Calgary International Salsa Congress. This event has drastically expanded the dance scene in Calgary, Alberta, Canada. He has judged and MCed many Provincial, National and International dance competitions and events. He is a recipient of an Albert Torres Award for growing and promoting Salsa and Latin dances in Canada. Throughout his competitive career he has performed on many international stages around North and South America. In 28 years of being in the dance industry, his students have won multiple gold and silver medals and numerous trophies in Regional and International Events. He has also taught thousands of people to dance through social dance group classes and made an impact on peoples’ lives through gentle encouragement, continuous support and belief in the human capacity to grow and expand. In the last 10 years he has played an active role as Dando Dance Company co-founder that gives an opportunity to adults to fulfill their dream of performance in as many as 40 different partnership dance genres. He has also known as an actor that danced with Hollywod Celebrities like Farah Fawcett in “Hollywood wives”; acted as a double for Michael Jackson’s biography “Man in a Mirror”; acted with Jamie Lynn DiScala in “Rise and fall of Heidi Fleiss” and multiple national commercials. Alongside that, he taught himself Flamenco Rumba guitar and co-founded the original “Los Morenos” Flamenco Rumba guitar duo, known in Calgary and around Alberta; released a CD where he is lead singer, plays Irish Tin Whistle and Flamenco Rumba Guitar. His other passion is bagpipes and illustrating. His current project is to complete the illustrations to his upcoming book ” Lifedance. The Power of Self Transformation” (to be released in January 2019). His creativity have taught him a lot about having a mind that is open to change and reinvention. Olya has acquired degrees in education, psychology and social pedagogics with specialization in the Entertainment industry, History of world’s Cinematography, and International Pop Culture in her native Russia. She studied closely, and became an honours graduate student under professor Alexandr Fedorov, well acclaimed russian scientist, teacher, media education specialist, film critic, former president of the Russian Association for Film and Media Education (2003-2014) current deputy director of the Anton Chekhov Taganrog Institute (Russia)and member of the Russian Academy of Film Arts and Science, Russian Union of Filmmakers, CIFEJ and FIPRESCI. Olya’s years of academic and practical training under professor Fedorov and others, continued to develop her sharp eye for fine detail and kinesthetics which she applies to her students’ and her own dance training. As an aspect of her pedagogic certification, Olya began teaching children’s movement programs. She is now sought out as a presenter for school dance programs within the city and province, and has also been involved with teaching dance socially and competitively primarily in Alberta – and also facilitating various workshops across Canada. Over her dancing career, Olya has been trained in choreography, ballet, acrobatics, Ballroom and Latin, International and American style, as well as Social Latin, Argentine tango and Country. Her competitive students have won numerous gold and silver medals at various competitive events. She has performed on many provincial and international stages and has been a headline performer for 9 years at ’Banff Springs Hotel International New Years Eve Gala’. For the past nine years Olya has been the proud owner and director of Dando Dance Company, where she actively choreographs and directs Dando Dance performance teams. Our goal is to promote wellness and harmony of individual Through dance. Why people come to dance? 99% of people come to dance for other reasons than dancing: To get healthier, enhance their social life or meet new people and friends, to find maybe a life partner, enhance their fitness level or loose weight.